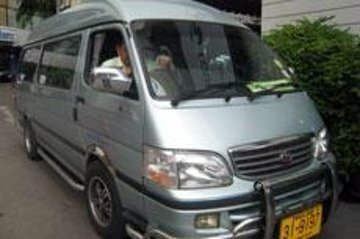 Get from your Koh Samui hotel to the Koh Samui airport on time and worry-free with a shared vehicle transfer. This ground service for airport departures is available 24/7—simply book ahead. Taxi arrived on time and the driver was pleasant and helpful. I also ended up having a private transfer, as there were no other pick ups. I did have to call the company the day before to check pick up time. Impressive, got help for check in and guided to the gate. Bra men det var jag som fick ringa representanten kvällen innan då de inte hört av sig vilken tid de skulle komma tidigt morgonen vi skulle åka. On time, clean air conditioned vehicle, driver new the route without assistance, I was the only passenger.